The sale of a prominent Sydney CBD address could spark its long-awaited development. 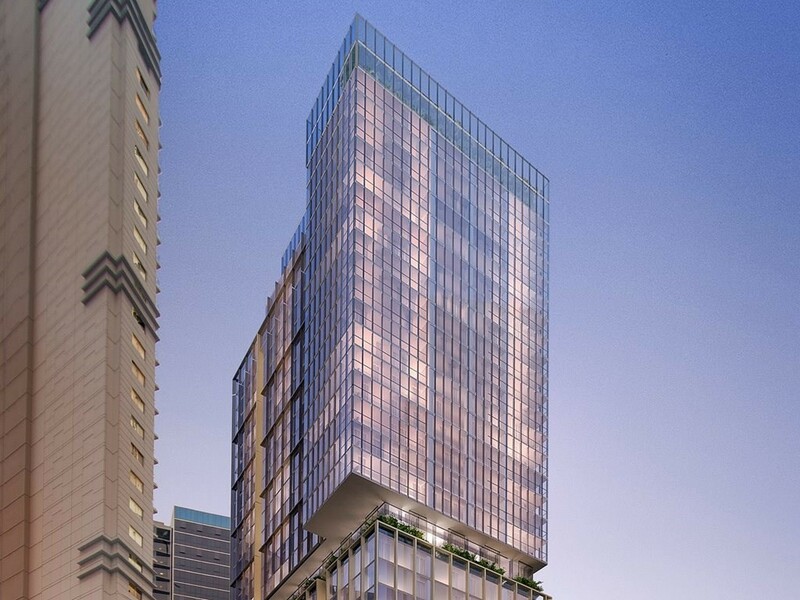 A joint venture consortium containing Australian and Singapore companies is tipped to purchase 59 Goulburn Street in Haymarket, which has held a development permit for a 38-storey hotel and residential tower since 2014. Designed by Crone Architects, the mixed-use development is Stage-1 approved for a 29,489sqm 38-storey project comprising 407 hotel suites, 90 apartments, and 3,720sqm of retail space. The project would repurpose the existing superstructure of the 30-storey commercial building currently located on the site, resulting in embodied energy savings of up to 30 per cent for the project. The site is surrounded by a mix of residential, commercial and tourist accommodation uses which include the World Square complex, the Ernst and Young commercial tower and the Inmark mixed use development. It is also down the road from the Darling Exchange major project which is currently under construction. 59 Goulburn Street joins a growing Sydney portfolio for Crone, which has been working in the city for over 50 years. The company, which rebranded from Crone Partners to Crone in 2015, has a number of significant projects currently underway, several which are collaborative efforts with other firms. At the time of the rebrand, the firm said it would be increasingly taking on design-focused commissions. In 2016, Crone won a design excellence competition win of the new 115-metre hotel and residential tower at 230 Sussex Street, and the team recently invited Japanese architect Kengo Kuma to collaborate on the design of the Wanda One hotel tower at the growing Alfred, Pitt, Dally and George street precinct (APDG) at Circular Quay. 59 Goulburn is also not the first time Crone has proposed to reuse the superstructure of the existing building for environmental benefit. Its recently completed 20 Martin Place in Sydney involved the retention of the existing building’s 22-storey structural steel frame, saving a total of 1,291 tonnes CO2e and earning the project a 6 Star Office As Built v3 rating from the Green Building Council Australia. Other Sydney projects from the firm include a Stage 1-approved 260-metre tower at 505 George Street and the nearly completed ‘cascading office block’ at 333 George Street as executive architect with Grimshaw.